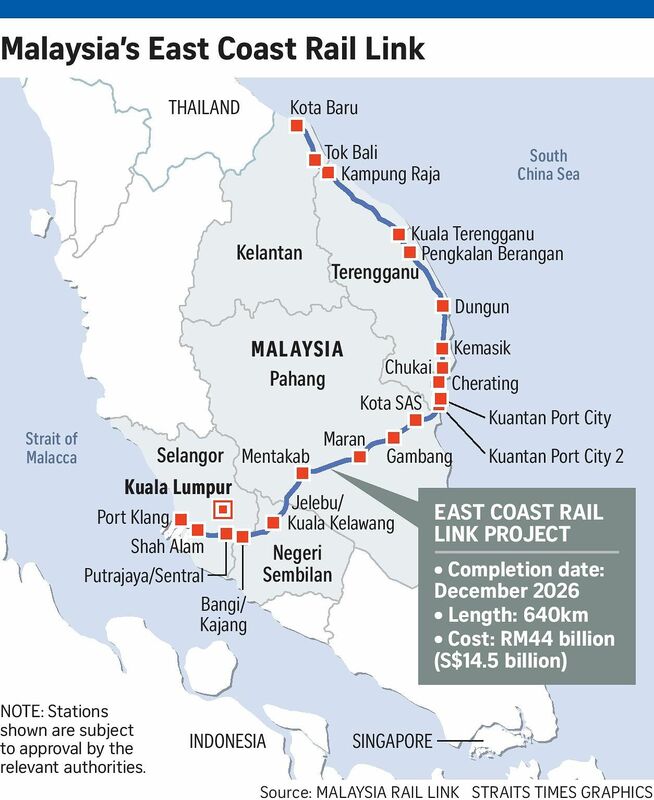 China has not only reduced the cost of building the East Coast Rail Link (ECRL) to RM44 billion (S$14.5 billion), but also agreed to a 50-50 joint venture to operate the 640km line across Peninsular Malaysia, reducing the financial risks for Kuala Lumpur. Malaysian Prime Minister Mahathir Mohamad revealed this yesterday at a news conference, where he described the reduction from the original RM66 billion (S$21.7 billion) deal - signed by the previous administration under former premier Najib Razak - as "a solution to our concern" about the so-called Chinese debt trap. "It is a considerable saving for us. The interest payment will be far less," Tun Dr Mahathir said, in a reference to the government's claim that taxpayers would have had to shell out RM81 billion in total for the double-track rail under the original deal. Under the new deal, local participation in civil works for what will be the key land bridge in Beijing's Belt and Road Initiative (BRI) has been increased from 30 per cent to 40 per cent. An official Malaysian source told The Straits Times that the joint venture to operate the line will see both firms sharing any losses, but "the profit will be 80-20 to us". The ECRL is one of the biggest projects in the BRI, an infrastructure programme which China says stretches across 152 countries around the world. Ensuring that the project proceeds will go some way towards stemming negativity surrounding the signature policy of Beijing's geopolitical strategy. By connecting the ports of Klang in the west to those in Kuantan in the east (before heading north along the east coast towards Kota Baru, the capital of Kelantan state), the ECRL links the Strait of Malacca to the South China Sea, one of the world's busiest shipping routes. About 80 per cent of China's oil needs passes through the strait. A statement issued by Dr Mahathir said the original RM56.7 billion loan obtained from Exim Bank of China would be reduced, "and we envisage that this will result in lessening... the principal repayment amount, total interest costs and other fees". But he refused to confirm if the initial fee agreed to by the former Barisan Nasional government, ousted following last year's general election, was inflated to include a bailout of troubled state fund 1Malaysia Development Berhad, which under Najib was riddled by financial mismanagement and malfeasance. "We suspect that was what happened because the price was so high and we can reduce it by as much as RM22 billion. This was a lump sum given to a company from China through a direct award," he said. Dr Mahathir revealed that Malaysia could not afford to terminate the agreement as compensation of RM21.78 billion would have had to be paid to Beijing. Instead, the new pricing will see the cost per kilometre of the line falling to RM68.7 million from RM95.5 million before. Dr Mahathir also said that while there was no direct link between the ECRL and other bilateral issues, "we are taking advantage of signing the agreement to work out the purchase of palm oil by China". Last Friday, China Communications Construction Company inked a supplementary agreement with Malaysia Rail Link (MRL) - the ECRL project owner - paving the way for the resumption of works on the line. MRL said the suspended works could resume as early as next month, with completion expected by the end of 2026. The route will be shortened from the 688km planned earlier and have eight fewer stops, although a source revealed that an additional station has been proposed for Shah Alam, the capital of Selangor state. The path now avoids cutting through the Klang Gates Quartz Ridge in Gombak, Selangor, the world's longest pure quartz dyke, which the government is proposing as a Unesco World Heritage site. It will instead travel south via Negeri Sembilan, reducing tunnelling and adding integration to existing rail networks such as the MRT, the Express Rail Link to Kuala Lumpur International Airport and also the Malayan Railways intercity service.